Cloud storage has revolutionized how we store, access and share data and applications. “The Cloud” remotely maintains, manages, encrypts and backs-up our valuable documents, often requiring little to no user intervention. Public cloud services, such as Apple iCloud, Google Drive and Dropbox, have become big business in the IT world, expecting to exceed $244 billion in 2018. For the consumer, cloud services provide an opportunity to avoid the inevitable bloating of limited mobile device storage, preventing photo and video recordings from bricking your device. It enables automated and immediate back-up of your data (if desired) and facilitates access of your storage from anywhere that has internet access. On the road without your laptop and need to email a document fast? Log on to the nearest computer and access your entire storage library from any web browser. For businesses, cloud services represent a great opportunity to synchronize the workforce, offering remote methods of working, and free up local infrastructure resources by outsourcing storage. Cloud services can negate the need to continuously upgrade in-house hardware, because it’s the third party provider that owns the hardware, not you. 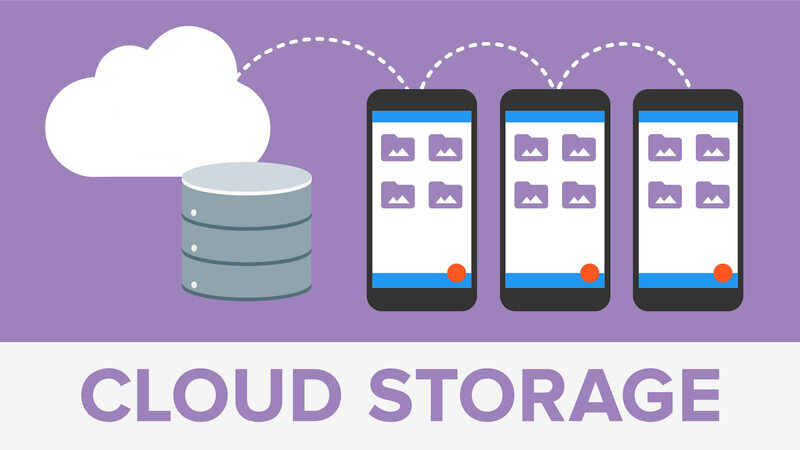 Companies that offer cloud storage to the consumer market include (but not limited to) – Dropbox, Google Drive, Apple iCloud, Microsoft OneDrive / 365, Amazon Cloud, SugarSync, Mozy, Windows Live SkyDrive, and Box. Companies offering cloud storage to commercial sector include (but not limited to) – IBM Cloud, Equinox, Dropbox, Microsoft One Drive, Zoolz, JustCloud, Hightail, OpenDrive, Mozy, Carbonite, Livedrive, Zip Cloud, ADrive, CrashPlan, and SOS Online Backup. Most cloud storage providers offer a User Interface similar to the native directory structure employed by most desktop operating systems, accessible from a webpage or a downloadable app. Most providers offer a desktop (or mobile) application that integrates into the menu bar or active dock of your operating system, affording you direct access to your online files. Some providers, such as Dropbox, partition a section of your local hard-drive, so that you have a physical back-up and offline access of your virtual storage. Some mobile operating systems have limited native filing capability. Indeed, up until iOS11, Apple’s mobile filing system was clunky to say the least. Thankfully iOS11 has addressed that with the new Files app, presenting a single interface for your iCloud documents, whilst natively integrating with other cloud storage providers, such as Dropbox, Box and Google Drive. Cloud storage, under normal circumstances, is available 24/7/365 and updates your files and applications as you do, providing you, effectively, with immediate back-up of your data. Systems such as Apple iCloud is capable of backing up your entire laptop or desktop computer, as well as your iPhone and iPad. Some cloud services, such as Microsoft 365 and Apple iCloud, offer a suite of applications native to their cloud infrastructure. Microsoft 365 have Word, Excel and Powerpoint, whilst Apple have Pages, Numbers and Keynote. Whilst not indelibly locked into its own cloud, using those applications have direct access to their own cloud services, whilst providing broader access to others. Many third-party applications, such as scriptwriting essential Final Draft, have mobile applications that natively save to selected cloud services. Because most cloud providers integrate with operating systems via their own applications, cloud storage offers a direct link between local and cloud storage. Adding (or removing) a file to your cloud is often a simple case of drag and drop, or saving a document directly to your cloud source. Emailing large files has always been problematic, having ground-to-a-halt many a mail server. Cloud services allow a user to store large files which can be shared and downloaded via an emailed weblink. There are lots of dedicated “file sharing” services (such as Hightail and WeTransfer), but many consumers and businesses are turning to cloud services for a more unified storage / sharing experience. By nature, cloud storage lives and breathes on the internet, so wherever there’s an internet connection, you have access to all of your files. This is great for mobile users – you can preserve local storage by streaming your music, videos and photos only when you need them. For businesses, this universal access facilitates home working by providing access to documents and applications remotely. This can help reduce premises costs and commuting pollution, whilst introducing flexible working terms that can be more attractive to today’s workforce. If the worst happens and a premises is compromised by fire damage, intrusion or theft, all files remain safe because they’re stored at a remote location. Companies that provide their own data storage need to maintain local servers that are liable to planned and unplanned outage, leaving the workforce without access to business-critical systems. Local storage requires dedicated real estate within business premises to house and run storage servers. Cloud storage, therefore, allows a company to outsource all of the maintenance and free up physical premises space. Most companies don’t upgrade their IT infrastructure regularly enough. This means that existing, old systems struggle to meet the ever-changing requirements of the business, reducing the efficacy of the workforce. Cloud services offer an excellent solution to the problem because the provider – whose business it is to provide efficient systems – keep their networks upgraded, so that the client doesn’t have to. Cloud storage is only as effective as your internet connection. One of the major benefits of virtual storage is the ability to access your files from anywhere. But if there’s no internet coverage, you’re stuck. This could be really problematic for businesses sending employees out on the road. There are solutions, of course, such as mobile tethering or internet hubs that access satellite internet connection, but the cost implications begin to add up. There’s also the possibility that the cloud service provider may have an unplanned outage, such as the one effecting Amazon Web Services (AWS) in September 2015. Their outage knocked Netflix, Tinder and IMDB temporarily out of service. As with all business critical services, it’s wise to have a backup plan – which generally means having a backup of your backup. Whilst the live nature of cloud storage is one of its major advantages, it does have the potential to be one of its drawbacks. Because the system is live, the simple drag-n-drop interface could allow you to accidentally drag-n-drop a file into a trashcan. If you (or a colleague) deletes an unprotected file by accident, then the whole company loses it. There’s often a fix, and most deleted files can usually be retrieved, but a situation such as this equates to lost work-hours and quite possibly an increase in the profusion of graying hair! If you can access your files, then it’s not entirely unfeasible to presume that a determined hacker can as well. You’re only as secure as your security settings and if they’re compromised, so is your data. There have been some high-profile examples of photographs “leaking” out of Apple iCloud and Amazon Cloud accidentally leaked the contact details of 2.2million Dow Jones & Co customers. Hackers are often only ever one step behind, which means that your security is just a few codes away from being compromised. For companies, of course, cloud storage can be potentially risky, because they’re releasing company-sensitive data to a third party residing in a (probably unknown) remote location. Of course, it’s absolutely not in a cloud provider’s interest to compromise the security of a client’s data, which means that they have literally impenetrable firewalls and super-high security. But does that really guarantee security? According to Mark Crosbie, head of trust and security at Dropbox, data is “sharded”. Each file is split into separately encrypted data chunks which are stored in different places. If an unauthorized user accesses and manages to decrypt the data, they’ll have access to random blocks, not the entire file, rendering it meaningless. Aaron Levie of cloud suppliers, Box, claims that hackers invariably target passwords, making the weakest link of the security chain the user. So, essentially, wherever you’re trusting your valuable data to a third party, make sure that your security isn’t undermined by a weak password. If you build your company IT resource around a portfolio of services offered by a third party, your in-house processes become dependent upon an independent body. This means that moving your storage from one company to another becomes difficult. How do you transfer thousands of terabytes from one company to another? And will they provide the same services? The problem with vendor lock-in, of course, is that once you’re reliant on a company, they can change their pricing structure and you have no choice but to accept it. But then again, you could say that about any IT services, from operating systems to subscription applications. I guess it’s just how the cyber world rolls.